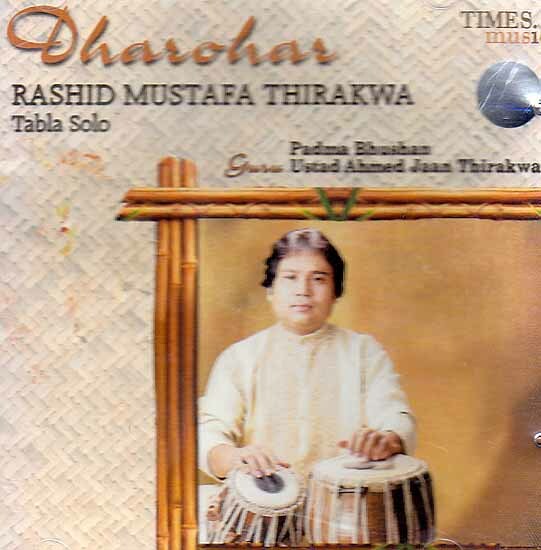 Padma Bhushan & Guru Ahmed Jaan Thirakwa Rashid Mustafa Thirakwa halls from the Farukabad Gharana a lineage of great musicians who have been pioneers in Hindustani classical Music especially in the Tabla Rashid was initiated into Tabla playing at the tender age of seven. He obtained strong grounding from his illustrious father the late Ustad Mohd. Jaan Khan Sahib and later strengthened his skill under the tutelage of his legendary uncle the late Padma Bhushan Ustad Ahmed Jaan Thirakwa Khan Sahib. Rashid Mustafa represents the fourth generation of his family and has vibrantly kept the family tradition alive through his own unique style of Tabla Playing. Besides performing as an established solo percussionist Rashid Mustafa has accompanied most of the eminent Hindustani classical vocalists. Instrumentalists and Kathak Dancers of India. He ahs received many awards and accolades for his versatility in Tabla performances including the Thirakwa title by Bhartiya Vidhya Bhavan in 1984 and was also awarded by the late Lord Menuin Award at Davos Switzerland.